I love scallops. Especially when they’re seared slightly crispy on the outside and tender on the inside. 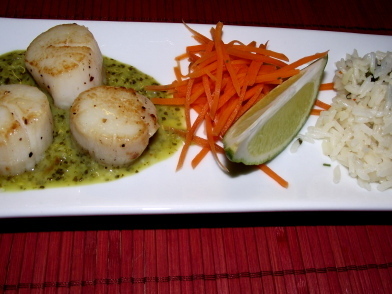 The flavors of ginger, lime & cilantro go beautifully with scallops, but remember that this sauce has a pretty bold taste so don’t drown them in it. A little goes a long way. Splash of olive oil & chunk of butter for frying Scallops. Blend everything except the scallops, oil & butter. Pulse until a nice smooth sauce. Heat over medium for about 10 minutes to cook the garlic and blend all of the flavors together. This sauce can be served hot or cold so if you want it cold, let it chill in the fridge until ready to serve. Puddle a bit of the ginger lime cilantro sauce on plate and place scallops on top. Serve with cilantro rice- which also tastes great with a little of the sauce on top!